The range of aspects to be included under the heading of “Restored from Death” is a wide one. It combines textual and theoretical, traditional and very current issues. There is, for example, the rather obvious case of a character being “recalled to life” who has been dead for quite some time. The restoration may be a magical, metaphorical, mythical, real … one; Dickens’ Dr Manette and Stevenson’s Captain Flint indicate just two possible ways. The subject may be seen from a rhetorical perspective (as when Quintilian, speaking of fictio personae, says “we are even allowed in this manner of speaking to bring down the gods from heaven and raise the dead”) or a historical and historiographical one (as when Nashe says about Shakespeare’s 1 Henry VI: “How would it have joyed brave Talbot … to think that after he had lain two hundred years in his tomb he should triumph again on the stage, and have his bones new-embalmed with the tears of ten thousand spectators at least.”) We may also consider the imaginary deaths of poets (e.g. in Berryman or Plath) or the fact that the writer brings (back) to life what otherwise would have remained nameless, forgotten or dead; at the same time, this poetical, dramatic or narrative (re-)animation implies the ‘killing’ of what is excluded from the author’s choice. 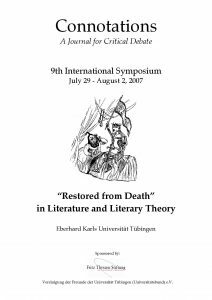 The myth of Orpheus as a model or archetype of a writer’s journey to the realm of death will probably be considered, just as memory will play a special role as a means of poetic resurrection (cf. Shakespeare’s Sonnets). Resurrection as Blasphemy in Canto 5 of Edmund Spenser's "The Legend of Holiness"